Precision Air helps customers protect their home comfort equipment and avoid high repair bills with a comprehensive selection of service plans that provide preventive maintenance and repair coverage. Our plans include the preventive maintenance that your systems need to operate efficiently. We also inspect the equipment during each tune-up to ensure that it is operating safely. If your equipment should ever require a repair, your service plan will cover the cost of parts and labor for any covered components. This agreement does not include the repair, or replacement of underground refrigerant lines, recording or portable instruments, electrical disconnect switches, casing or cabinets, insulation, gas lines, water lines or non-moving parts such as ductwork, vents, flues, or grilles. 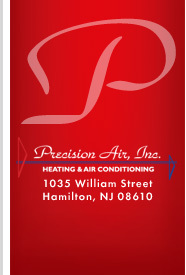 Precision Air Inc. shall not be required to furnish any equipment, service or materials, perform any tests, or make any modifications that have been recommended or required by any insurance company, governmental authority, equipment vendor, or regulatory authority, or pay any future taxes imposed by any governmental agency. Occassionally, Precision Air Inc. cannot properly run and test the equipment before initiating coverage. If we find any covered equipment in need of repair during the initial startup and checkout of the equipment, we will notify the customer in writing and will include a written estimate of the required repairs or replacement of equipment. At that time Precision Air Inc. will no longer be responsible for the equipment until after repairs or replacement authorized by the customer are completed. If authorization is not received within (30) days, an appropriate adjustment to the agreement price reflecting deletion of this piece of equipment will be made. damage or loss resulting from freezing, corrosion, electrolysis, vibration, plumbing stoppage, failure of any utility service, low voltage condition, lighting, single phasing, or other electrical abnormalities. damage or loss resulting from negligence, faulty system design, abuse, acts of God, malicious mischief, vandalism, or improper operation of equipment by customer's employees, agents, or tenants. damage, loss or delays resulting from fire, explosion, flooding, the elements, strikes, labor troubles, civil commotion, or any other cause beyond its control. any accident, injury, damage or loss to equipment, personal, property or revenue unless directly caused by its negligence. any indirect or consequential damages such as, but not limited to, loss of revenue or loss of use of any equipment, process, or facilities. any identification, detection, abatement, encapsulating, storage, removal, handling, recovery, recycling or transportation of any regulated or hazardous substances. Regulated or hazardous substances may include, but are not limited to, asbestos, certain refrigerants, and used refrigerant oils. If any such materials are encountered during the course of work, Precision Air Inc. can discontinue the work until the regulated or hazardous substances have been removed or hazard has been eliminated and Precision Air Inc. reserves the right to be compensated for any loss or additional expense incurred. Unless otherwise noted, Precision Air Inc. shall not be liable for equipment replacement, starting and stopping equipment, space temperature regulation, air balance, indoor air quality, equipment relocation or maintenance or non-emergency repair other than during normal work hours. If customer requests non-emergency work be performed other than during normal hours, the customer agrees to reimburse Precision Air Inc for overtime pay or additional charges. Precision Air Inc shall use ordinary care in performing the tasks outlined in this agreement. No inspection shall guarantee the condition of the equipment or eliminate obsolescence and normal wear. any alterations, additions, adjustments, or repairs to covered equipment, by anyone other than Precision Air Inc.
breach by customer of any term of this agreement. If Precision Air Inc. brings legal action to enforce this agreement, and is successful, it shall be entitled to recover reasonable attorney fees and the cost of litigation in addition to any judgement for damages. Refrigerants, methods, and materials used in the process of locating a refrigerant leak or leaks, are not covered under this agreement. Any repairs not included will be performed at a 15% discount of our normal rate. Filters supplied by Precision Air Inc. are 1" pleated filters. Any other size or type is additional. Precision Air Inc. reserves the right in its sole discretion, to schedule safety clean and check dates. Heat exchangers, evaporator/condenser coils and compressors are not covered under this agreement. Any repairs not included will be performed at a 15% discount of our normal rate. Prior to calling Precision Air Inc. for a service call, customer should check emergency switches and thermostats for correct positions, programming, and settings. Service calls resulting from these are subject to normal diagnostic and service rates. This agreement contains the entire understanding between Precision Air Inc. and the customer. Any modifications, amendments, or changes must be in writing and signed by both parties. The customer shall operate the equipment in accordance with the manufacturer's recommendations and promptly notify Precision Air Inc. of any abnormal conditions.